A succinct collection of useful tips and guidelines, by Roger Evernden is now available in paperback and Kindle editions. This is a book for enterprise architects and anyone interested in the design of our digital future. It explains 101 clear and simple lessons that the author learned from the practical use of enterprise architecture techniques. These are the common-sense things that you learn from long-years of experience. But they are also the sort of things that can easily get overlooked or forgotten. 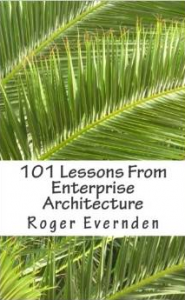 The 101 topics provide insights and lessons into the way that enterprise architects actually think about architectures, and how they help enterprise change and transformation. It covers many of the fundamental techniques – from ways of working, to how value depends more on dynamic elements than static ones, to open-ended design, and the nature of logic. Each insight uses a two-page format – with a brief explanation and an illustration highlighting the key points in a whimsical or diagrammatic way. There are quotes, such as the one from Einstein about computers being fast and stupid, while humans are slow and brilliant. There are guidelines and recommendations, such as playing with elements in diagram to organize them in a way that makes them less complex and easier to understand. And there are plenty of examples, anecdotes and stories to explain things that are too often omitted from the standard enterprise architecture training programs. Written by an enterprise architect, mentor, and trainer, who regularly helps and guides individuals, teams and companies to apply enterprise architecture techniques in practical and effective ways. “101 Lessons From Enterprise Architecture” is a concise summary of some of the most important techniques in day-to-day enterprise architecture practice. It summarizes valuable knowledge and experience that will benefit anyone starting out in enterprise architecture through to experienced practitioners. It will also provide inspiration and guidance to those in many other disciplines – from IT development and planning, to business strategy and planning, or anyone involved in design for the information age.